July 28, 2017, 9:14 a.m.
Jessica Lessin, founder and editor-in-chief of the subscription tech news site The Information, gets a lot of questions on how to create a news business like hers, and over the roughly four years that The Information — which costs $399 a year (less for students, and $10,000 for an extra-premium product) — has been in business, she’s provided casual advice to those who want to follow in her footsteps. Lessin is particularly interested in hearing from startups that want to transform local news. Expertise: A key aspect of our program is The Information Boot Camp, where those we back will work with our team in San Francisco. Our team has learned a lot about the best ways to build a subscription news business, from which articles drive subscriptions to what you need in a CMS. And as a publication that covers the tech industry, we have unique insights about how technology can be used to help, not hurt, journalism. We want to share that advice to help entrepreneurs climb the curve faster. Distribution: We’ll help entrepreneurs find their first subscribers with distribution across our large base of subscribers who value premium content. Capital: Our goal is for companies to exit our program with meaningful revenue (for example $100,000 in annual recurring revenue with a path to much more). To get started, we’ll invest at least $25,000 in each business in exchange for some very small financial participation to ensure alignment. We believe in making businesses self-sustaining as soon as possible so they can scale as they deliver value to readers. Our program isn’t designed to help entrepreneurs raise money. It is designed to help them make money. — Star reporters and small teams who want to report on important subjects, including local news and science, as well as entrepreneurs from inside and outside the U.S. There are other accelerators that focus on (Matter) or sometimes include (Y Combinator) media startups, but The Information’s is unusual in that it will focus on a specific type of news product and it eschews venture funding from the beginning. Owen, Laura Hazard. "The Information launches an accelerator for subscription news startups, with investments starting at $25K." Nieman Journalism Lab. Nieman Foundation for Journalism at Harvard, 28 Jul. 2017. Web. 19 Apr. 2019. Owen, Laura Hazard. "The Information launches an accelerator for subscription news startups, with investments starting at $25K." Nieman Journalism Lab. Last modified July 28, 2017. 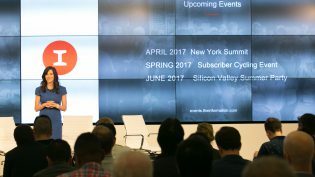 Accessed April 19, 2019. https://www.niemanlab.org/2017/07/the-information-launches-an-accelerator-for-subscription-news-startups-starting-at-25k/.